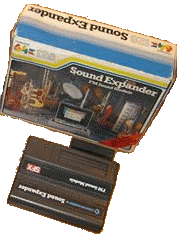 The Commodore Sound Expander or SFX Sound Expander is a sound synthesizer cartridge with 9 voices for the Commodore 64. It was developed by Richard Watts. 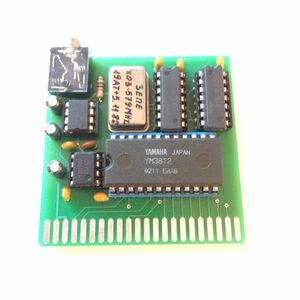 The synthesizer chip is a Yamaha YM3526 OPL, which can upgraded by a YM3812 OPL2 chip, which is also used by AdLib- and Soundblaster sound cards in PCs. This cartridge was produced by Music Sales Limited in the UK and marketed as "Commodore SFX series" by Commodore world-wide. 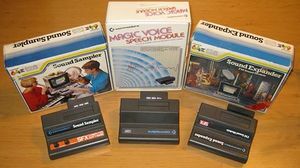 Commodore cartridges: SFX Sound Sampler, Magic Voice (Speech Module) and Sound Expander (FM Sound Module). A manual (user's guide) exists, but provides very little technical information. And also the audio lead book "Start Playing Keyboard - The SFX-Tutor" by Peter Lavender. SFX interface for connection a external SFX keyboard. Software "F.M. Sound Expander" (aka "Riff Machine") by Music Sales Ltd. on datasette or disk. Original software: "F.M. Sound Expander" (aka amazing "Riff Machine") on tape or floppy disk. CSDb - Release No. 147615 FM-Sid by "4-Mat"
CSDb - Release No. 157163 Vibrants FM by "Xentax"
Clone without external keyboard connection. Since 2016 exists a "Sound Expander clone" by Krzysztof Iwanowski, which can bought for 25 Euro. 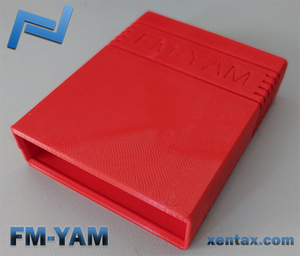 Xentax released FM-YAM  in March 2018. FM-YAM is a Sound Expander compatible with ym3812 (OPL2), audio in (to mix SID audio) and audio out (with FM and SID mixed). Over 200 cartridges have been sold to date. See MsMadLemon's review here: https://www.youtube.com/watch?v=Q32I0jk7THE. It also featured in the Zzap!64 Annual 2019. This page was last modified on 1 November 2018, at 17:15.